Getting a pay raise while sitting on the couch? Sign me up! Thanks Omega Healthcare Investors for the dividend increase! It's hard to believe that we're almost two full weeks into 2017. While time keeps marching forward one of the other things that keeps progressing is my dividends. Each year starts off pretty slowly for dividend growth for my current holdings, but finally the dividend growth resumes. Yesterday, the Board of Directors at Omega Healthcare Investors announced a raise to their quarterly payout. 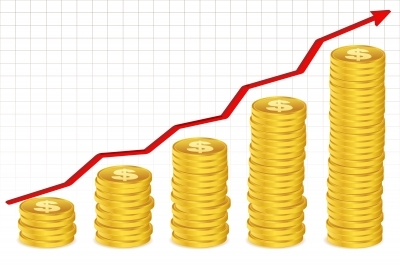 The dividend was increased from $0.61 to $0.62 or 1.64%. Assuming the dividend is at least maintained at this level for the rest of 2017 this will represent 13 consecutive years of dividend growth giving them the title of Dividend Contender. Shares currently yield 7.62%. That raise might not seem all that great on the surface, but a deeper dive into Omega Healthcare Investors dividend history paints a different picture. Unlike many companies, Omega Healthcare Investors prefers to give smaller raises each quarter. The February payment in 2016 was $0.57 so 2017's payout represents an 8.77% increase year over year. Omega Healthcare Investors has now increased dividends for 18 consecutive quarters. Since I own 77.904 shares of Omega Healthcare Investors in my FI Portfolio this raise increased my forward 12-month dividends by $3.12. This is the 7th dividend increase I've received from Omega Healthcare Investors since initiating a position in early 2015. Cumulatively my Omega Healthcare dividends have risen by 14.8% from dividend growth alone! According to USInflationCalculator the total rate of inflation over the same period is just 1.8%. Omega Healthcare Investors' dividend raises might come at a slow rate if you look at any individual increase; however, they're most definitely adding up. 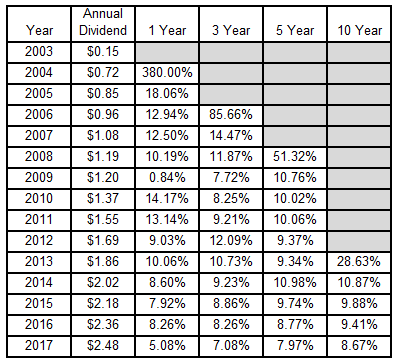 Since fluctuations in the business cycle can effect a company and in turn my dividend growth, I prefer to look at dividend growth rates across various time periods to encapsulate changes in the outlook for the company. *2017's annual dividend assumes 4 payments at the $0.62 per share per quarter rate. My forward dividends increased by $3.12 with me doing nothing. That's right, absolutely nothing to contribute to their operations. Based on my portfolio's current yield of 2.91% this raise is like I invested an extra $107 in capital. Except that I didn't! One of the companies I own just decided to send more cash my way. My FI Portfolio's forward-12 month dividends increased to $5,560.12. Including my Loyal3 portfolio's forward dividends of $67.01 brings my total taxable accounts dividends to $5,627.13. My Roth IRA's forward 12-month dividends remain at $242.54. Do you own shares of Omega Healthcare Investors? Do you prefer your dividend growth all at once or quarter after quarter? Just bought it last week already money at work. I hold OHI shares also. I have received several raises as well from them. I don't really have a preference on raises, as long as they keep giving them. I think this company will greatly benefit from the aging baby boomers. Hopefully there will be some buying opportunities created in the near future and I will be able to lower my cost basis. Thanks for sharing. I have been trying to figure out a paradox in OHI's dividend increases. Assuming they raise the dividend by a .01 per share per quarter (which has been the norm), that equivocates to .01+.02+.04+.08 compounded from the beginning of the year, or .15. But the difference between one year and the next is .16. Where did the extra .01 come from? Between the 5/2016 and 8/2016 payments they bumped it up $0.02 rather than the $0.01. There's your missing $0.01. No, it has nothing to do with last year. Figure it out for any year, it comes up the same. Think of it this way with $0.01 raises every quarter then the payments work out like this. So the difference from each quarterly payout is $0.04 Y2Q1 - Y1Q1, Y2Q2 - Y1Q2... 4 x $0.04 = $0.16.